One thing crossed my mind when I got Matthew's fifth solo CD in my hands: "Good to have you back, Man!". 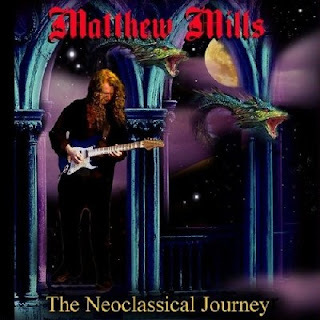 For all of us who cannot attend Matthew's shows and guitar clinics, his albums prove that Neoclassical Metal still has some loyal and talented "servants". After I listened to "The Neoclassical Journey", I believe that probably is his best solo effort. The talented virtuoso contributes his finest guitar work in splendid songs like the opener "Thoughts Of Time", which once again highlights his favorite songwriting style: strong, catchy and melodic riffs combined with astonishing guitar cadenzas that established his reputation over the years. "Dark Matter part 2" is deeply emotional, sentimental and European-flavored song, with strong Baroque influences. Matthew reaches the limits of his performance and always tries to set new standards for his favorite musical style. Its difficult to follow a Neoclassical Metal path without being repetitive but Matthew proves this opinion wrong. Just listen to the song "Night Time": Melody and atmosphere combine smoothly and the result is wonderful. For all the above reasons, I cannot stop listening to Matthew's musical creations, even though I am not a guitarist, so that means a lot.